Blind Sophie found the basket of kindling by the wood stove in the dog room the other day and decided to parade around the house carrying a piece of firewood. We don’t know why. But she has done something similar before — as we posted a few years ago, she once found a wooden door-stop and marched around the house with that in her mouth, too. For some reason, though, Sophie is never around to help me when it’s actually time to split the wood and stack it in the shed. Oh, she looks so happy. Must be a dachshund thing. 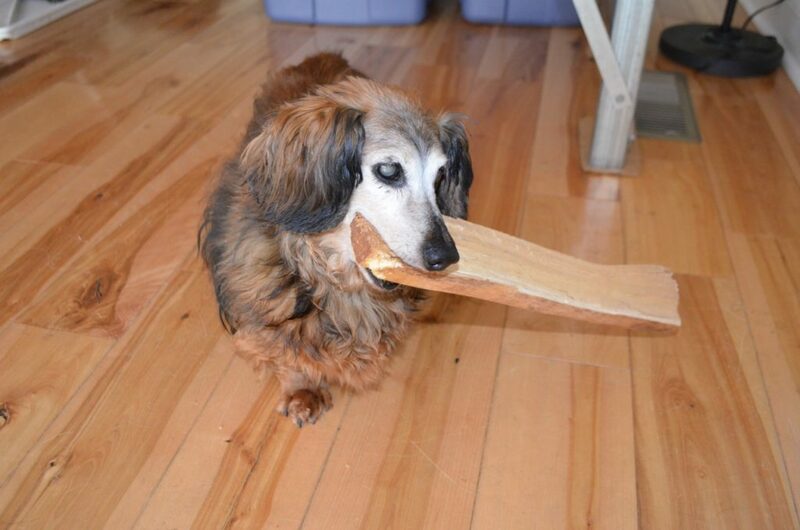 Our dachshund mix loves to carry a big stick when he’s out on a walk. He’ll go for the biggest one he can find, and then prance along proudly with it. I’m sure Sophie would help you with wood-splitting – she’d eat the chips and get the kindling out of your way. That is so cute. I remember that last story. I’m sure that she is being helpful in her own way. And was she growling as she was walking?? That sweet girl is just like Timex….She takes a licking and keeps on ticking! All my beautiful dachshunds have gone to the rainbow bridge with all their funny little quirks so I get such a kick out of seeing Sophie. Thanks for the post. That’s really cute!!! She’s very proud of her find!!! She’s secretly building an extension on the house. Maybe she just wants to make s’mores over a fire. Funny little girl! Looks so proud of herself. Hugs to you little Sophie!